It’s way crowded most mornings, and parking along Jefferson Blvd. can be pretty tight any day of the week. But power hikers and joggers of all stripes come out for the invigorating climb to the top. Because the views are some of the best in southern Santa Monica Bay. 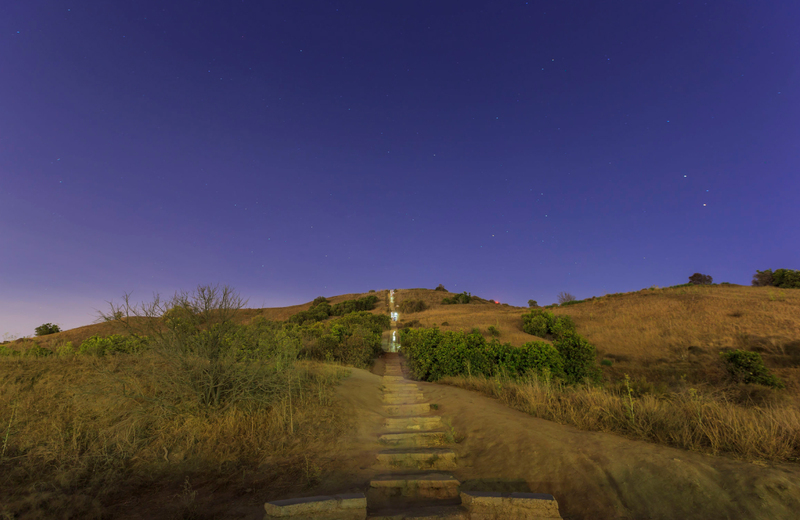 Most visitors of Baldwin Hills Scenic Overlook want to work their quads and get in a good cardio, but you can just drive up to the top and pay $6 bucks to park if you’re not feeling the burn. By the late afternoon the crowd is gone and it’s a great spot to catch the sunset. The inverse of this equation is technically below sea level. From Jefferson, take La Cienega down to Culver Blvd. and head for the coast. You’ll wind up at the northern tip of Dockweiler State Beach where lies the infamous Sunken Boat of Playa Del Rey. The story goes something like this: after the 70-ft Angelique caught fire and washed ashore in February 2014, the owners couldn’t afford to have it dredged out of the sand, and the city, well they just flat out refused to pay for it. So there she sits. Last year she was painted over by taggers and is now a colorful local Instagram target. The hull has created a sort of underground basement, which is pretty eerie and probably not worth climbing down into. But it’s still there for a look-see, right near the end of the beach at the inlet.